Red Dead Redemption was one of my favorite games in 2010 and Rockstar’s hit of the year. 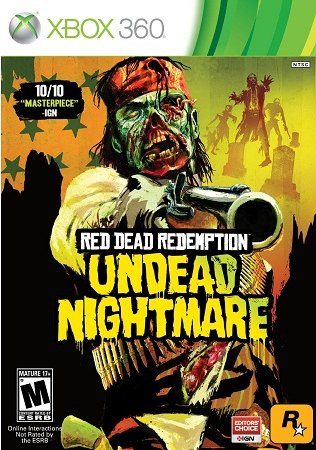 It was initially supported with DLC focused on multiplayer, but with the Undead Nightmare, Rockstar has created content on par with the Lost & Damned and Ballad of Gay Tony. Undead Nightmare is a ton of fun, and one that worth picking up either with the retail disc or simply downloading it for Xbox Live. Taking place toward the end of RDR, Undead Nightmare shows John Marston going home to his family after fighting through a lot to get back to them. After relaxing with them for a bit, they’re visited by an old friend who doesn’t look like himself and appears violent and crazed. Without going into more detail without spoiling much about the story, Marston finds out the dead are coming back to life and that they’re rapidly taking over the frontier. Being the hero that he is, Marston sets out to find a cure so he can finally have the peace with his family he so desires. The story here will keep you for about 9+ including more if you want to experience all that the Undead Nightmare can provide. Start to finish you’ll be in for a undead treat with a great story of how zombies came to the West. The Undead won’t go down permanently until you give them a nice clean bullet to the head. Hitting anywhere else will knock them down or give you a bit more time to line up a clean shot, but headshots are your friend in this game. Besides your usual arsenal of weapons to choose from, Undead Nightmare provides new additions to use against the undead horde and provide for some pretty epic kills. Those who have survived so far in the Undead Nightmare have taken to various locations across the map to defend themselves. All of these are marked on the map so you can help them against undead attacks, and in exchange the people will offer you shelter and ammo; something very scare in this add-on so collect all that you can. Overtime these places can be attacked again, so look out for when this happens since your source of ammo will be in jeopardy. The single player portion of the Undead Nightmare is incredible with returning characters to interact with and new weapons to face new enemies. There are plenty more challenges to complete as well alongside more rewards for doing so. If you choose to pick up the retail disc you will get all the previous DLC as well without losing precious hard drive space, so this package is a great deal. Those already with Red Dead Redemption can simply download the Undead Nightmare for just $10 even though it as an equal amount of content when compared to the $20 Ballad of Gay Tony and Lost & Damned from GTA IV. Rockstar has done it again and proves to be the best at delivering great single player experiences, and leading the way for Downloadable Add-Ons.